Over the years, we’ve accepted payments for lino Premium via PayPal, and In-App-Purchase through our iOS and Android app. Now, we’re pleased to announce that we’ve started accepting payments with your credit card. 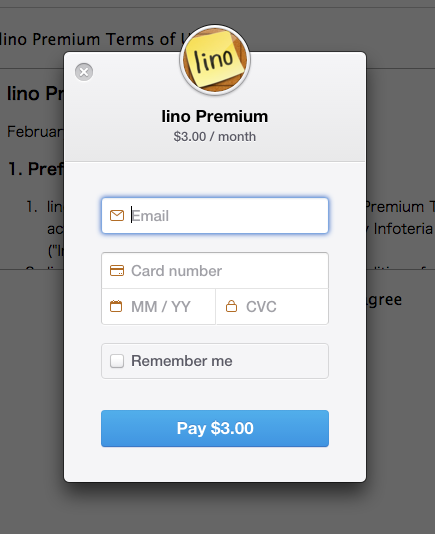 Now, you no longer need to create your PayPal account to subscribe to lino Premium. Payments will be made using Stripe, as a subscription. It means that when you subscribe to lino Premium, you’ll be charged every month until you unsubscribe from it. Visit lino Premium to find the benefits of lino Premium and subscribe now! We’re pleased to announce that we’ve released Apple Watch App for lino. To use lino on your Apple Watch, please install iOS App for lino to your iPhone. With lino’s Apple Watch App, you can manage today’s tasks more quickly. You can check your today’s tasks on your Apple Watch, and even peel off a sticky when you’ve done your task. Of course, you can receive notifications from lino with your Apple Watch when someone posts a sticky on your canvas. When it receives a notification, it “Handoff” the sticky, so you can view or edit it on your iPhone without hassle. 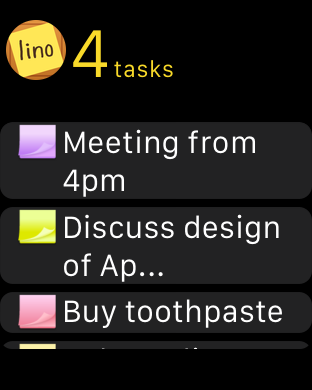 Why don’t you manage your tasks with lino and your Apple Watch! As you may have heard of Heartbleed, there has been a large flaw in OpenSSL that could allow attackers to theft of data protected by SSL/TLS encryption. Unfortunately, lino used the version of OpenSSL that has this flaw. We updated OpenSSL and replaced our certificate immediately. So now our servers are not affected by this flaw. Although we have no evidence that your password has been exposed, we encourage you to change your password. You can change your password at Preference page. We’re pleased to announce that we’ve released the latest version of lino iPhone/iPad app. In this version, we’ve added support for Push Notification. When someone posts a sticky on your canvas or a group canvas, we send you a push notification so that you don’t miss it. And now, you can see the number of tasks due today as a badge on the app icon. Use lino to manage your tasks and you won’t forget them. In addition, we added some features that makes it easy to use lino with your friends, like sharing a canvas via email and Twitter. 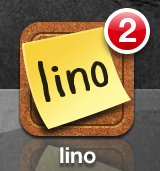 It’s time to try lino iPhone/iPad app now!